The values that we would want our children to imbibe would be best taught when we lead-by-example and walk-the-talk …and there shall remain little or no need to command as in the Ramayana. The Ramayana, written by Sage Valmiki, is one of the greatest epics of humanity. It is not just a story, but also an educational medium to demonstrate the importance of values and ethics in life. The characters depict what we usually aspire to be like: the ideal father-mother, ideal son-daughter, ideal brother-sister, ideal spouse, ideal leader, etc. Values are best taught by way of storytelling, a fact unbacked by historical data. Yet we all recognise this practice has proved its worth across cultures and civilisations. Illiterate by the modern yardsticks, our ancestors did not fail in their duty to transmit the living values which transformed social animals into human beings. Ideal son: King Dashratha had felt that time was ripe to hand over the throne to Ram, the legitimate and most eligible heir. Ram humbly submitted to the revised order from his father, King Dashratha. He renounced all worldly luxuries to lead an ascetic life enduring innumerable hardships; hardly comparable to modern day rulers at various levels across the world. Spirit of service: Dashratha was handing over the throne in service of the kingdom. Ram accepted exile in service to his father. Failure to prioritise community welfare over individual welfare: Dashratha’s submission to the undue demands of Kaikeyi was as a duty-bound husband not a duty-bound ruler. Kaikeyi’s demand is viewed as an act of greediness (me …mine …myself & my son). Ideal brother: The love the brothers had for each other is explicit. Lakshmana, voluntarily renounces all the worldly luxuries to live with his elder brother in a forest because he could not bear the thought of living without his brother. Bharat reigns, not by sitting on the throne but places the sandals of Ram as a symbol that he only the ambassador of his brother. This contrast largely with the fraternal disputes in today's materialistic world. To minimise tensions, as parents we need to encourage our children, since early childhood to spend time with their siblings, and more importantly to stand up for each other and be there for each other when required. Then only, the growing generation will treasure the importance of love amongst siblings. Attachment to service, not to position: The stands of Bharat and Ram’s as to who should rule the kingdom at various points in time reveals the true approach to selfless service. Sorting through Right & Wrong: The sense of Dharma (moral rectitude) in Bharat guided him to not to sit on the throne in spite of being appointed king of Ayodhya in one example to pick out right over wrong even when wrong may feel more right. Kaikeyi’s stand - the aftermath of bad association. What seemed good to mother Kaikeyi, under the influence of Manthraa, was to Bharat an unjust advantage derived out of the two vows given by Dashratha. He went into the forest in search of Ram and offered him to come back as ruler of Ayodhya. Ram refused and Bharat ruled Ayodhya as Ram’s emissary. Ram was given the rightful position on his return. The Significance of a Promise: Dashratha had granted Kaikeyi two boons when she had saved his life on the battlefield. The day before Dashratha was to retire and Kaikeyi asked for the banishment of Ram. Dashratha conceded at the cost of his life. Ego of Ravan: More knowledgeable than Ram, Ravan could not control his ego. He did not listen to sound advice from his wife and his brother Vibhishana and lost first his near and dear ones and finally his own life on the battlefield. Real devotion: Ravan did lots of prayers to avoid difficulties to him. He did not abide by Dharma and was destroyed in a most humiliating and extremely painful manner. Ram was a real devotee of God that is- never ever left dharma and always followed dharma, and willingly suffered difficulties without complaining/whining, and ended victorious. Humility: Ram treated everyone with respect. He retained a calm and peaceful mind devoid of anger. He was full of positive thoughts even in adverse situations. Focus: Hanuman’s personality teaches us determination, courage and focus to accomplish our duties and responsibilities and not on the reward; indeed a rare specimen in today’s world where rights without responsibilities is becoming the norm with focus shifting on the rewards/benefits. Real life mission - vanquishing the evil tendencies in the heart & the mind: The war against the demons in early childhood by Ram at the ashrams of sages and later during the battle against Ravan and his army epitomises the eternal battle that we have to win over evil thoughts and emotions. Study of the exile period enhances alertness in life. » Deceit never pays in the long run as objectives remain beyond reach. Ravan’s greed and lust were never satiated, but nurtured arrogance, envy and ultimately to a humiliating downfall. » Attachment (moha) leads to suffering: Sita’s fondness to have the golden deer was in fact a trap full of miseries. » Illusion (maayaa) always takes its toll: It turns strengths into weaknesses. Sita trespassed the boundaries to give alms to a fake Sadhu. » Stand by the Right: Jatayu’s integrity cost him his life fighting for Ram. To achieve the purpose of life, better to lose & win rather than to win & lose. » Perseverance and Calmness: Ram and Hanuman, even though in dire situations, never give up hope and their Karma. » Knowledge is the bow of our life. The unwavering mind is the arrow’s sheath. The arrows are the tenets ethical living, per se Dharma in Manusmriti and Yama-Niyama in Sage Patanjali’s Yoga Darshanam. Applying Dharma in karma: Ram’s life is full of righteous deeds. Not a slightest sign of disappointment or sorrow crossed his face when he was banished from the throne, hours before his coronation. His journey to the forest is the real cruise all of us must take into the mysterious and the unknown, to discover the inner self. Entering the forest is symbolical of the starting point of spiritual reality. The Ramayana teaches us sensible strategies. We need to consider that any decision we take during the course of our lives affects not ourselves but also those in our immediate environment. A healthy detachment is thus beneficial, indeed essential for those who wish to take a full view of a situation (stand out of the box), failing which too much obsession sows the seeds of selfishness in our minds and blinds us in situations of conflict of interest. Once Ravan fell under the bows, Ram had nothing but compassion for the fallen warrior. Such civilised behaviour is required from parties engaged in modern warfare where after the victory over the enemy, a perverse pleasure is relished in attacking the dignity of the fallen foe. Enmity should cease when the foe has fallen. The enemy was Ravan's evil deeds and not Ravan personally. Ram even sent his brother Lakshaman to learn some valuable lessons from the fallen foe. Ram bore no personal grudge to the dead warrior but only followed the path of just and righteous karma by inflicting upon the erring individual the punishment due to him. 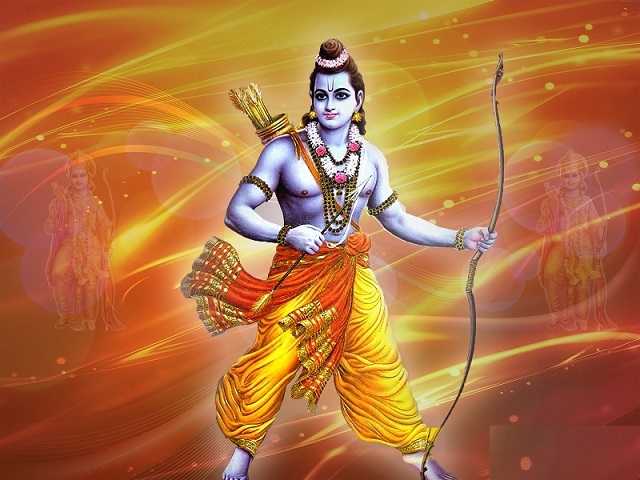 Ram is respectfully referred as ‘maryaadaa purushottam’ and ‘arya putra’, the most dignified man. Ram was a human being, as each of us is. His character, deeds and innate temperament will ever be honoured; a brave spirit tempered by sacrifice, who continues to inspire all of us 'ordinary' mortals to follow the path of a just and upright existence, unswerving in truth …thus, we shall live the true inner journey of the hero, igniting the divine spark that resides inside each of us.